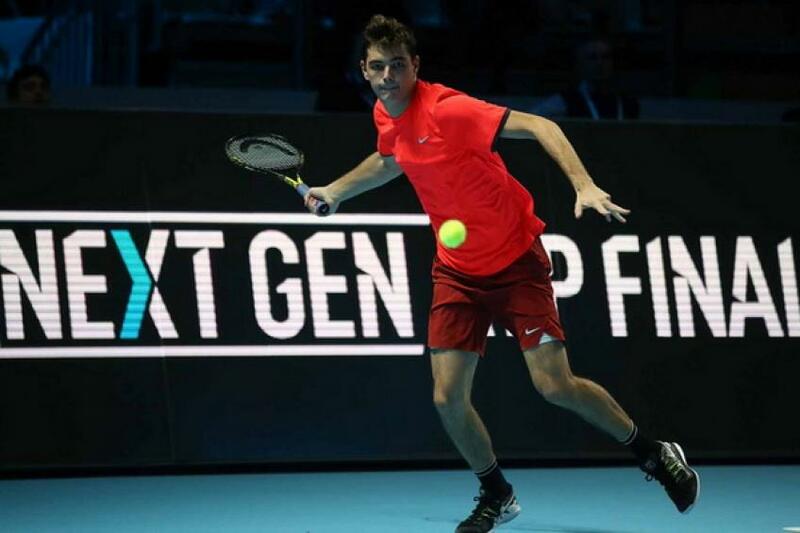 Taylor Fritz came back from losing the first set to beat Italian wild card Liam Caruana 1-4 4-1 4-3 (11-9) 4-2 after 1 hour and 21 minutes. Caruana gave Fritz run for his money in a very close tie-break in the third set, but he lost it 11-9. Fritz wasted a game point in the fourth game of the opening set. Caruana won the killer point with a backhand return winner on the deciding point in the fourth game. The Italian player sealed the first set 4-1 on the deciding point in the fifth game. Fritz earned the break in the fourth game of the second set on the deciding point to seal the second set 4-1, when Caruana sent his backhand long. Fritz closed out the set with three winners in the fifth game. Caruana fended off a break point at the start of the third set. Both players went on serve setting up a tie-break. Fritz earned a mini-break on the fourth point for 3-1, when Caruana made a double fault. Caruana got back on serve on the sixth point with an unforced error from Fritz. Caruana made a double fault on the eighth point for 4-4. After a trade of mini-breaks Fritz earned a set point at 6-5, but Caruana saved it with a forehand winner. Caruana did not convert three set points at 7-6, 8-7 and 9-8. Caruana hit a spectacular diving drop volley winner to earn the second of his three set points, but Fritz saved this chance with an ace at 9-9 before winning the final two points to win a dramatic tie-break by 11-9. The fourth set went on serve until the sixth game, when Caruana went down 0-30, as he was serving to stay in the match. He rallied to 30-30 but Fritz broke serve for the second time in the match on the next point to close out the match, when the Italian player hit a forehand long. Fritz, who lost against Andrey Rublev yesterday, will face Alex De Minaur on Thursday. The US player won 23 matches on the ATP Tour this season and reached the semifinals in Houston and Chengdu. “I think I was a little worried because he definitely has it in his mind that he can beat me. I lost against Liam lots of times when were juniors. I remember a certain match with him where he beat me 2-0 in the semifinals of a National in Claremont. We are really good friends. I can’t count how many times we must have played each otherwhen were were 12 and 14 years old. That was definitely an interesting thing going into the matchto think about. I stayed in the system of playing in Southern California, sometimes playing nationally. I went to a regular high school. I decided to leave school and go to USTA to train in Florida where all the real good guys are. That’s when I realized that, if I actually wanted to be a pro, I was going to have be better than those guys”,said Fritz. Fritz enjoyed playing in Milan with a new format. “As far as the format goes, I like it a lot. It makes tennis more entertaining and it’s trying something new. I think tennis needs to try to appeal to be more exciting and get younger fans involved. Everyone I have talked to said they find this more exciting. There is certain things I would definitely change. I disagree with coaching. I think tennis is individual and how you analyze yourself should have an important impact on the result”. Sixth seed Hubert Hurkacz edged Spain’s Jaume Munar 4-2 4-2 2-4 3-4 (5-7) 4-1 after two hours and 3 minutes to move to 1-1 in Group A keeping his chances of qualifying for the semifinals alive. The Polish player took his first win against Munar, who took beat his Spanish rival in their previous head-to-head clashes at junior level. Hurkacz won just four points more than Munar in a very close match. The Pole saved six of the nine break points he faced and converted six of his twelve break points. Hurkacz dropped just three points on serve in the opening set and converted his fourth set point on return with a backhand down the line in the sixth game of the first set on the deciding point to claim the first set 4-2. The second set went on serve in the first three games before a streak of three consecutive break. Hurkacz broke in the fourth game to open up a 3-1 lead, when Munar sent a backhand long. Munar broke straight back in the next game. Hurkacz broke again to close out the second set, whne Munar netted a forehand. The third set started with three consecutive breaks. Munar broke serve at love in the first game of the third set. Hurkacz broke straight back to draw level to 1-1, but Munar broke again in the third game to take a 2-1 lead. The Spanish player won his next two service games to close out the third set 4-2 with a service winner. Munar won the killer point in the second game of the fourth set and fired a backhand down the line to bring up a set point at 6-5 in the tie-break. He closed out the tie-break 7-5 to force the match to the fifth set after Hurkacz made a backhand error. Hurkacz converted his second break point in the first game of the fifth set and hit a service winner on the killer point in the second game to back up the break. Munar went up 40-0 on return to earn three chances to pull the break back, but Hurkacz won four consecutive points to save all break points for 3-1. The Pole broke serve on the deciding point with a backhand return to close out the five-set match. Hurkacz started the year as world number 238, but he won two ATP Challenger tournaments to break into the top 100 for the first time in his career. Hurkacz will face number 1 seed Stefanos Tsitsipas on Thursday. “The new format is different. It’s funny because you get on the court and do everything quick. You need to the racket in the hand and sprint to the center and do the coin toss. For the warmup it actually works out. If there would maybe one minute after, it might be good. You can get used to it, but for the first time it’s different”, said Hurkacz.